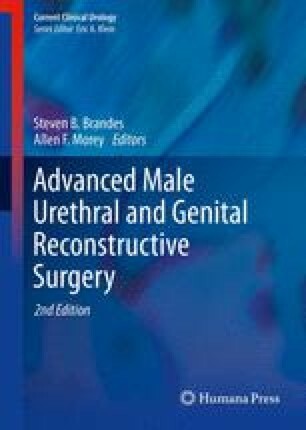 An intimate knowledge of male external genitalia and urethral anatomy is essential for successful surgical management of male urethral strictures, fistulas, and other anomalies. Of particular importance for urethral reconstruction is the prepuce, a mixture of skin and mucosa and anatomically divided into five layers – epidermis, dermis, dartos, lamina propria, and epithelium. The urethra is divided into the anterior (bulbar, pendulous, and fossa navicularis) and the posterior (membranous and prostatic). Urethral epithelium transitions from urothelial (transitional cell) (proximal) to pseudostratified or stratified columnar (distal), and then onto squamous (meatus). Location of the urethra within the spongiosum is also clinically important, where the more proximal (bulbar) the more eccentric and ventral.